I made red wine cupcakes this past weekend. My friend found the recipe and thought it was interesting, so I decided to give it a shot. It was the first time I’ve ever baked with wine and it was a pretty interesting experience. 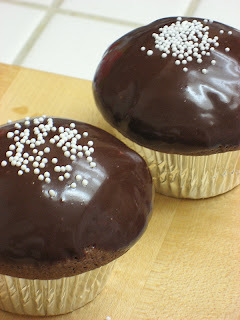 The cupcakes were made with red wine and the frosting had red wine in it too as well as balsamic vinegar! They turned out lovely, but I wasn’t quite fond of the taste. Maybe its because I’m not a red wine fan…but despite that they everyone else said they were good. If you do decide to make these cupcakes be forewarned that they are pretty rich so make sure you have some milk in the fridge before you eat them.